This post is sponsored by Mud Pie Market–all opinions are my own, as always. This post also contains affiliate links. 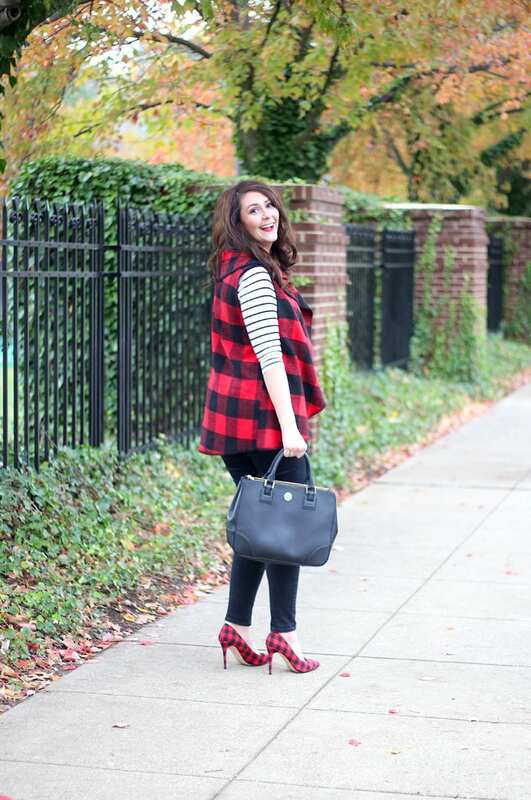 All hail the return of buffalo plaid to the blog! If you’ve been around, for awhile, then you KNOW that I adore buffalo plaid, and I especially love wearing it for the holidays. 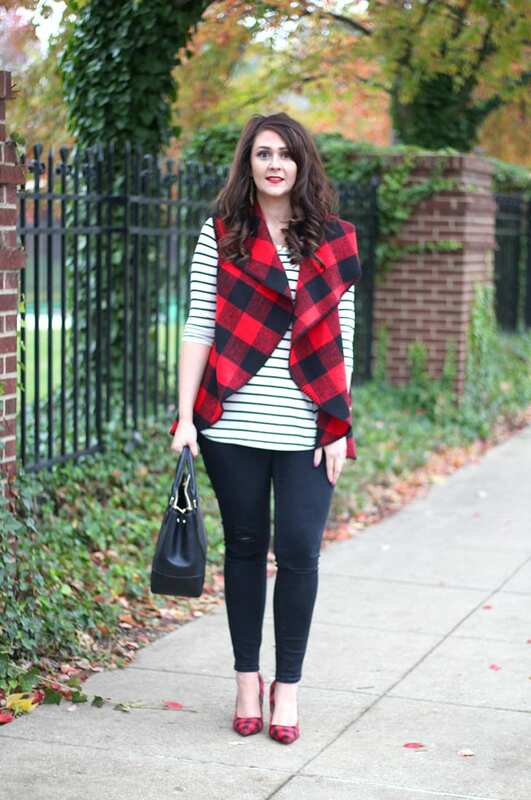 Today I’m sharing a Thanksgiving dinner outfit featuring this buffalo plaid blanket vest and buffalo plaid heels. When it comes to holiday dinners, like Thanksgiving, I like to dress comfortably. I also try to wear layers because you never know what temperature someone else’s house will be if you’re visiting for Thanksgiving dinner. 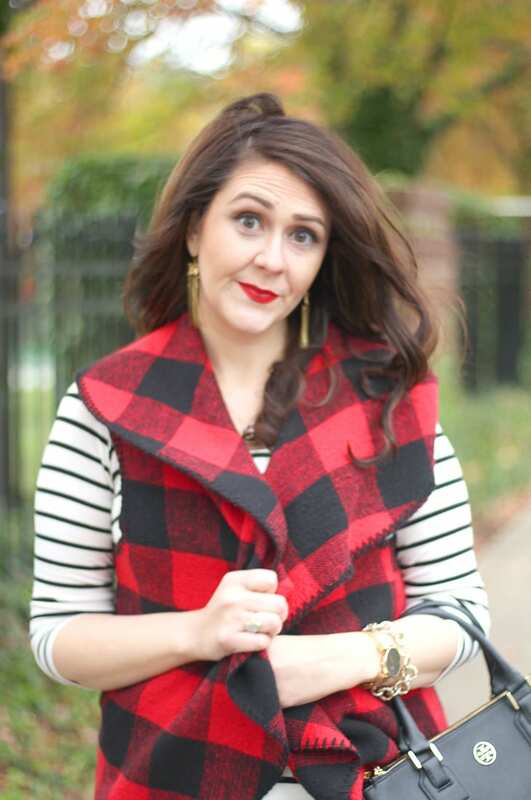 This buffalo plaid blanket vest from Mud Pie Market is the perfect solution! It’s so soft and cozy. It’s also under $35 when you use code BRIGHT10OFF! 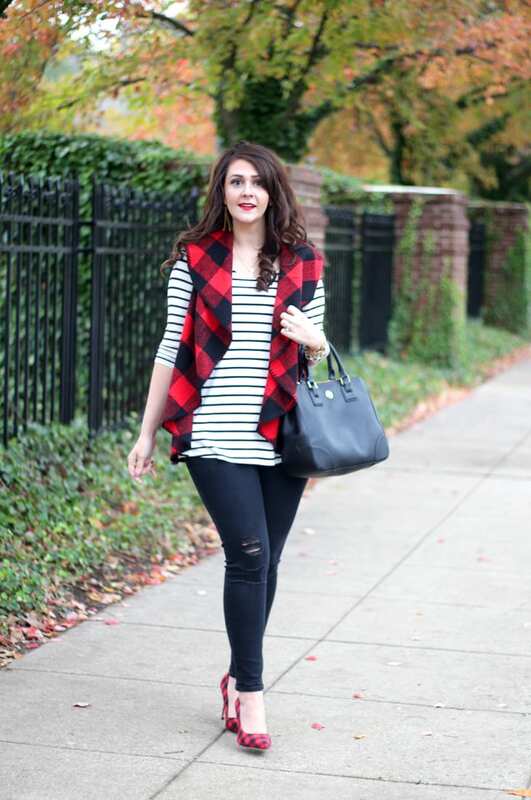 When I wear buffalo plaid, I love to pattern-mix with black and white stripes. The two go together like peanut butter and jelly. 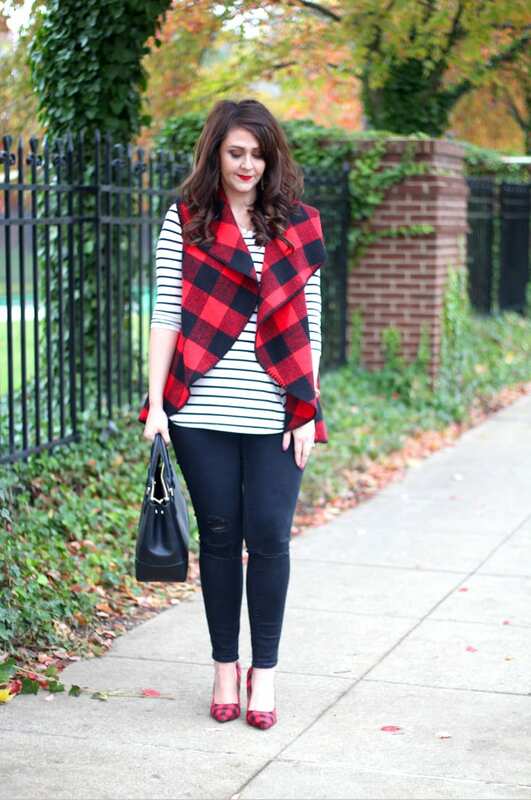 So I layered my buffalo plaid blanket vest over my favorite striped top. If you’re pregnant, I highly recommend this top as it can be used for nursing after you have the baby. I wore it here as well. Here, I’m wearing my favorite black maternity jeans with ripped knees. This outfit would look just as cute with you’re favorite leggings though. And to pull the buffalo plaid back in, I added my fav buffalo plaid heels. These heels are so great for the holidays, and there’s just a few sizes left, which are on sale for $20. Mud Pie Market is like an outlet for Mud Pie Gifts. You can find adorable Mud Pie products at steep discounts, and even save an EXTRA 10% when you use code BRIGHT10OFF. I’ve found their clothes to be quality-made, easy to wear, and super affordable. You may remember this burgundy dress I have that would be great for Thanksgiving dinner as well. Mud Pie Market also has the cutest Thanksgiving pieces for both home and baby! 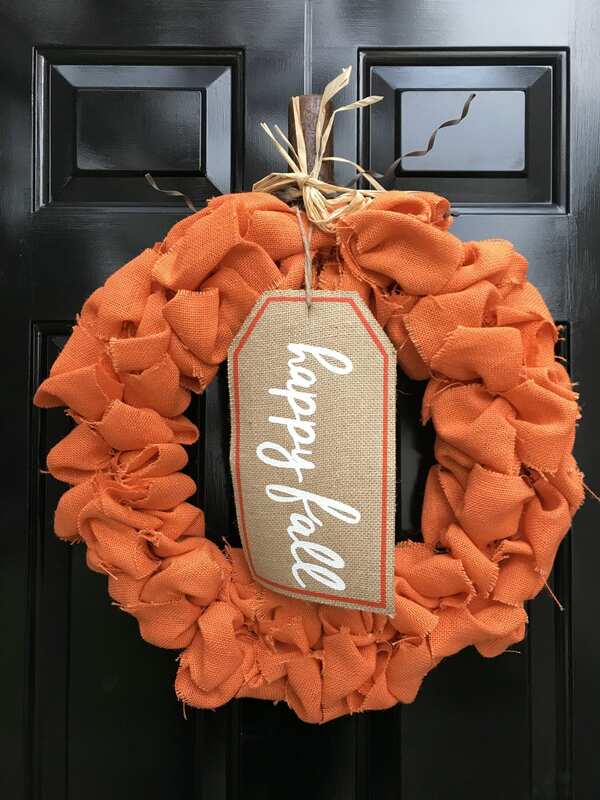 Whether you’re looking for some Thanksgiving decorations or a hostess gift for Thanksgiving dinner, be sure to check out Mud Pie Market’s Thanksgiving selection. Most items are 50-60% off. I just absolutely love how you embrace pattern and colour. Love this look. Also I really cant stop reading posts in your accent now hehe. 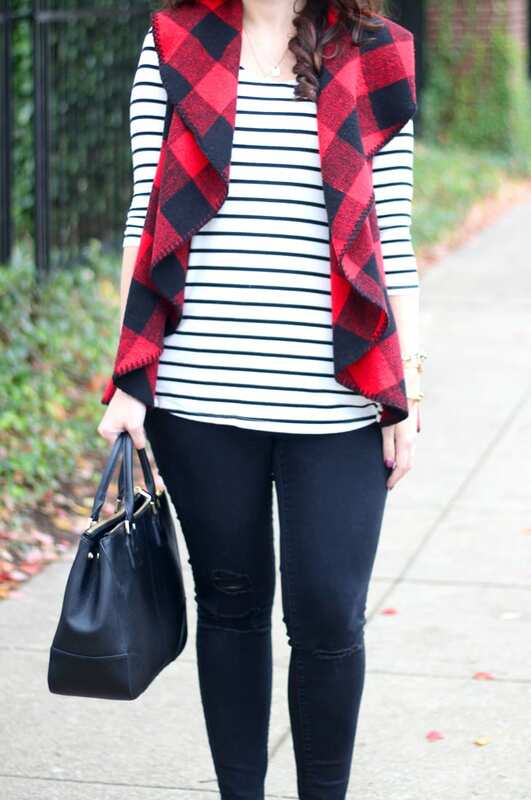 I love the stripe and buffalo plaid combo, just gorgeous! You know I can get behind this outfit! 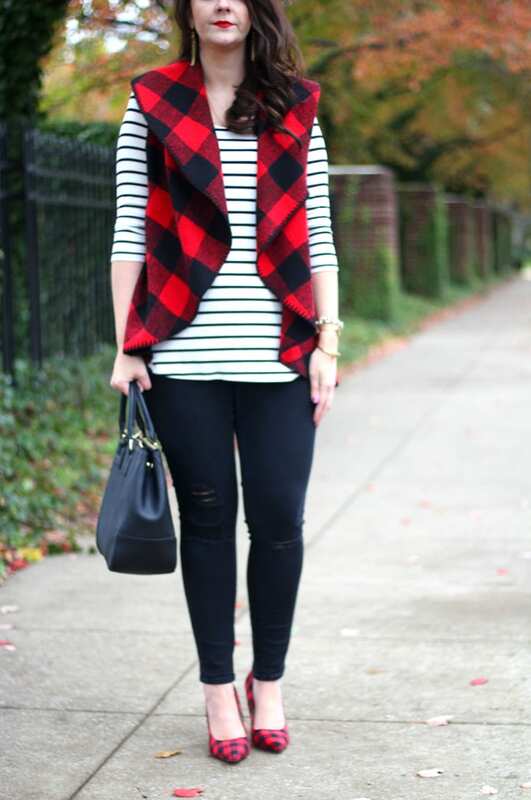 I love the plaid vest and shoes! so cute! Love this look! 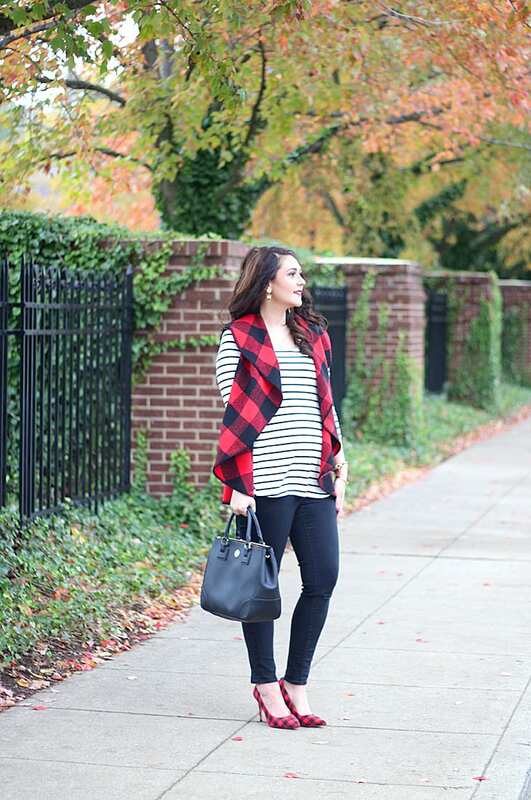 The plaid mixed with stripes is spot on for fall! 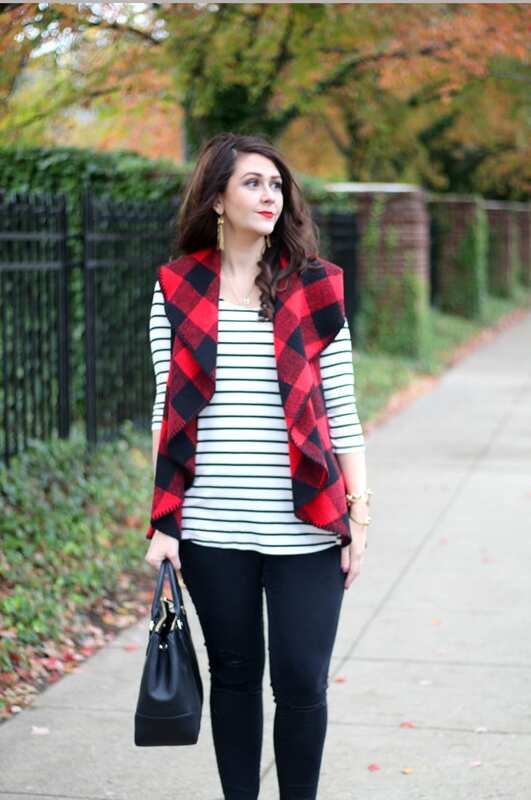 I love buffalo check & this vest is so cute!! I normally am not a plaid person but you rocked this look so well! I am loving the buffalo plaid with the stripes! Such a cute fall look! I really love this look so much. The perfect thanksgiving holiday outfit. 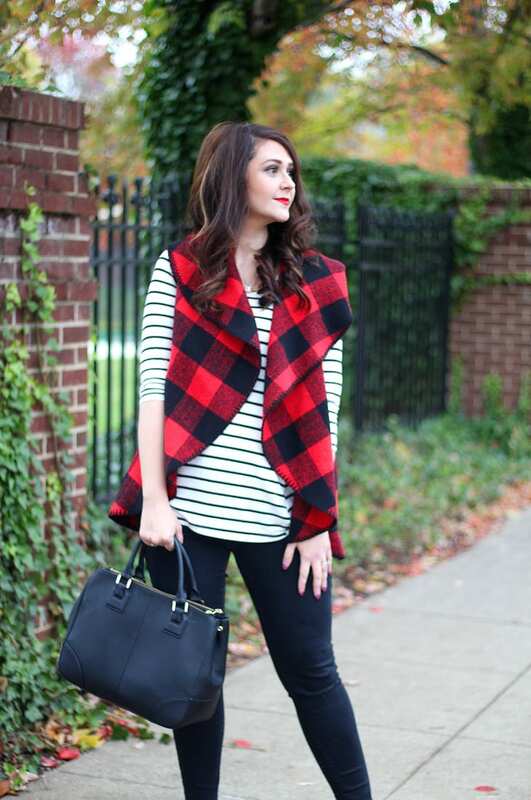 Buffalo plaid is just the perfect pattern for fall and winter! Love this vest and how versatile it could be with so many looks! You look so stunning! Those shoes are amazing!! Such a perfect fall look! I think I need that vest! Thanks so much for sharing with Fun Fashion Friday! Love how your heels match the vest. So cute! love the matching vest and shoes, so cute! How perfect is this for the holidays! That vest has Thanksgiving written all over it! What a great vest, love the print!